Tina Weinberg with a group of her nursing students at UH. A love of learning energizes Tina Weinberg every day at Michigan Medicine. Recently, Tina has turned her focus toward playing a more formal mentoring role at U-M, joining the School of Nursing as an adjunct lecturer. Tina always wanted to become a nurse after growing up with parents who were in and out of the hospital. “I would watch the nurses and thought that they were so important and so smart — and my view of them hasn’t changed at all!” Tina said with a laugh. She became the first person in her family to go to college before joining Michigan Medicine as a clerk in 1995 and then as a nurse three years later. The last two decades — during which she’s raised three children of her own along with a stepson, earned her bachelor’s degree and is in the process of pursuing a Master’s — have been challenging, yet incredibly rewarding. For that reason, Tina has met with students twice a week for the past two years and rounds with them as they interact with patients and family members. 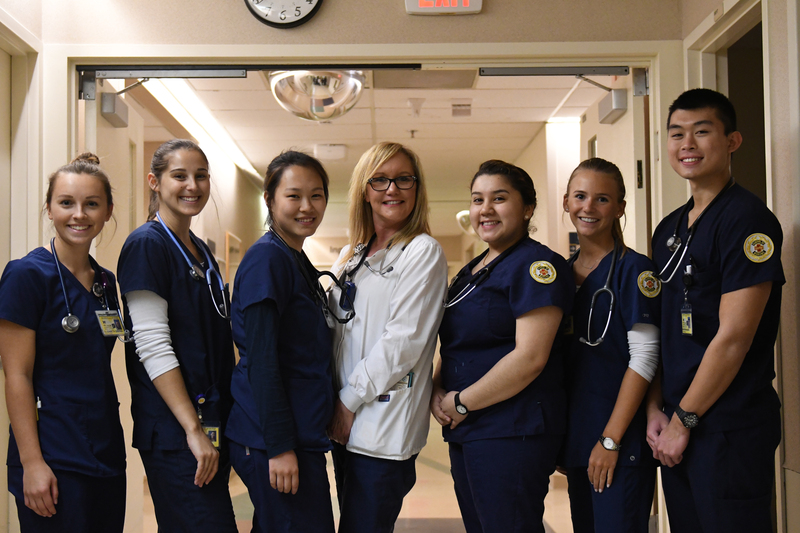 Tina said it’s fascinating to watch future nurses go through experiences for the first time. Her main focus is impressing upon students how well-rounded nurses have to be. So Tina teaches her students to read body language and to understand that everything they say to a patient or family makes an impact. She also teaches them what sort of signs to look out for in a patient in order to determine the level of care he or she needs at any moment. For Tina, such mentorship is a two-way street. There’s also a personal stake in teaching that Tina thinks about often. “These students are the ones who will be taking care of me and my family one day,” Tina said. Getting them ready to perform their duties is a responsibility that Tina has no problem shouldering. In fact, she plans to teach even more once she completes her Master’s degree.